In early 2011, SAWPA upper management staff developed a Strategic Plan for SAWPA. On April 5, 2011, the SAWPA Board approved a new strategic plan vision, mission, values, and goals. The vision, mission, and values are defined as follows. SAWPA’s vision is a sustainable Santa Ana River Watershed that provides clean and reliable water resources for a vibrant economy and high quality of life for all, while maintaining healthy ecosystems and open space opportunities. A successful SAWPA provides value to its member agencies and to the watershed as a whole by facilitating collaboration across boundaries to address common goals and tackle problems that are larger than any individual entity. Influencing legislation for the benefit of the watershed. in the development and advancement of a vision and plan for a sustainable watershed, and in the incorporation of new paradigms for water and watershed planning. among member agencies and other stakeholders in the watershed toward the formulation and implementation of solutions to watershed-wide, multi-jurisdictional problems. in the pursuit of new approaches to watershed planning, the use of new technologies, and the enhancement of new water ethic in the watershed. to identify neutral and transparent solutions that maximize the benefit to the entire watershed. for all voices and perspectives in the watershed to develop sound solutions and maximize consensus building. to maintain the respect and trust of our partners, and to attract and retain talented and committed individuals to our organization. Advance and coordinate regional projects/programs to achieve OWOW goals for desalination, water reuse, water use efficiency, groundwater recharge/conjunctive use and stormwater capture and recharge. Develop watershed-wide strategies and plans for desalination, water reuse, water use efficiency, groundwater recharge/conjunctive use and stormwater capture and recharge. Support and coordinate multi-agency initiatives that enhance the flexibility and reliability of water supply systems. Administer and support regional approaches to conform to TMDLs and Basin Plan requirements. Coordinate watershed-wide monitoring program aimed at reducing compliance costs. Develop strategy and market basis for water quality trading. Promote establishing new stormwater quality standards and pathogen indicators toallocate resources more efficiently. Support Emerging Constituents (ECs) sampling program and explore public outreachprogram for ECs and other constituents of public concern. Support salinity management efforts and coordinate watershed-wide salt management activities. Investigate alternatives for conveying future brine flows and alternative discharge points, including brine concentration. Address brine line rehabilitation and relocation needs. Market the brine line to maximize flows from industry and other users. Develop solutions to minimize O&M costs of brine line due to solids formation andscaling. Revise financial strategies and ownership of capacity to eliminate idle capacity. Develop mechanism to provide mitigation opportunities for ongoing operational activities and new construction projects in areas occupied by endangered or threatened species, or in other sensitive areas. Facilitate opportunities for regional management of species and habitat. Support removal of invasive plant species by identifying and prioritizing target species,and by securing funding for removal and habitat maintenance efforts. Promote solutions to manage waterways to protect all beneficial uses, includingmanagement of sediment and soft-bottom channels. Develop consistent message in water issues for use by agencies in the watershed. Publish information demonstrating the economic value to the watershed of sustainablewater resources practices and regional collaboration. Establish a repository of information on water quality to assist agencies in analysis anddecision-making. Help foster and brand a unique Santa Ana River Watershed identity. Highlight to land-use agencies the interrelationship between land use planning and water resources and provide information to support decision-making. Promote regional approach to stormwater permit compliance that effectively integrates water supply and integrated regional water management opportunities. Coordinate with land use agencies to resolve issues and avoid disputes associated with water management activities. Coordinate the development of a climate action plan that addresses GHG mitigation and adaptation to climate change providing compliance on a regional scale. Identify opportunities for multi-agency cooperation in the development and implementation of GHG mitigation and adaptation actions. Leverage OWOW Plan and future updates to increase the clout of the region in securing funding. Influence state and federal legislation to increase funding for the region. Explore new funding opportunities, such as private sector and foundations. A framework for an Action Plan was then commenced. SAWPA department heads were asked to identify lead departments for each strategy, time frames of completion over the next four years, and estimated labor hours by department to complete each strategy. 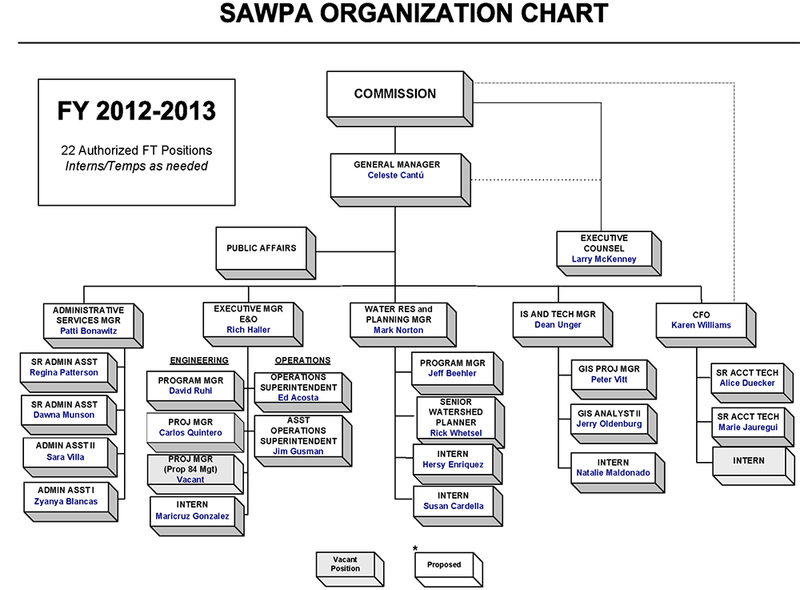 Labor hours to operate the functions of SAWPA such as Administrative Services, Finance, and Executive Management were not delineated, but were included based on support to other departments. Current staffing also was reflected in the Action Plan with comparison charts to show existing and projected work load necessary to complete the Strategic Plan. For some departments, the charts reflect that additional staff would need to be hired to complete all the strategies defined. The work tasks by lead SAWPA department to accomplish the Goals and Objectives or “Goals and Strategies” as defined in the Strategic Plan Action Plan are shown in Appendix A. Resources required in accomplishing the work tasks of the Strategic Plan are discussed next by each Department. The resources necessary to accomplish the work tasks by the deadlines defined will be dependent on a number of factors. Each of the work tasks reflect a combined effort of Planning staff, IT staff, Legal staff, Administrative Services staff, Finance staff, interns, and the General Manager. Completion of each new work task prepared by each lead SAWPA department is based on sufficient support resources from other departments. Insufficient support resources from other departments may also jeopardize the completion of the tasks by the estimated completion date defined. Further, a basic assumption is made that other resources such as adequate and working computer tools (hardware and software), office supplies, work area space, and tools are available and functioning properly. Currently, the Planning Department consists of the following staff. Based on the SAWPA FYE 2012 and 2013 Budget completed prior to the SAWPA Strategic Plan, an additional planning staff member was recommended based on a Strengths, Weaknesses, Opportunities, Threats (SWOT) analysis conducted by the Planning Department in September 2010 as part of the CA Department of Conservation Watershed Coordinator grant application. At that time, the SWOT analysis showed that an additional watershed planner position was needed to assist the department in accomplishing the department goals and objectives particularly in light of additional work to be undertaken involving the DWR Proposition 84 planning grant and U.S. Bureau of Reclamation Basins Studies Program to both support OWOW Plan 2.0. The department has been at its historical core level of three full-time employees for over 25 years. Need exists to expand staffing resources to support the department goals prior to the addition of the additional work tasks associated with the SAWPA Strategic Plan. As a strategy, the Planning Department had proposed under the FYE 2012 SAWPA Budget that based on a need by the SAWPA Engineering and Operations Department for a part-time administrator for the new State Proposition 84 IRWM Implementation projects, a new full-time employee (FTE) could be hired with this person’s hours shared between Proposition 84 grant administration and the balance of the new staff member labor hours being devoted to Planning Department goals and objectives accomplishment. It was anticipated that a 1⁄2 FTE in FY 2011- 12 and 3⁄4 FTE in FY 2012-13 may be available for planning functions. Additionally, the Planning Department proposed to continue to rely on two temporary planning interns to support the department primarily in Roundtable and OWOW Plan update activities envisioned for FYE 2012 and 2013. 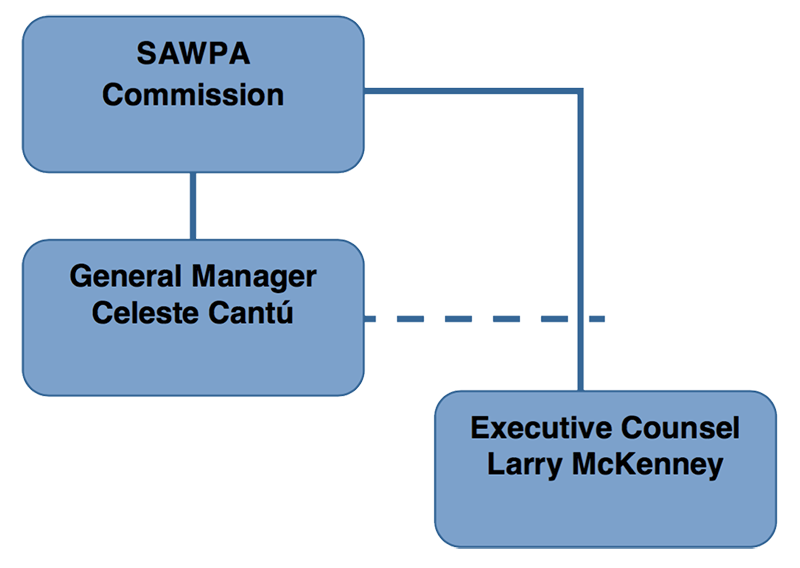 In evaluation of the work load to complete the SAWPA Strategic Plan, an independent evaluation of work load and staffing resources by SAWPA department was prepared by Salvador Lopez under contract with SAWPA. 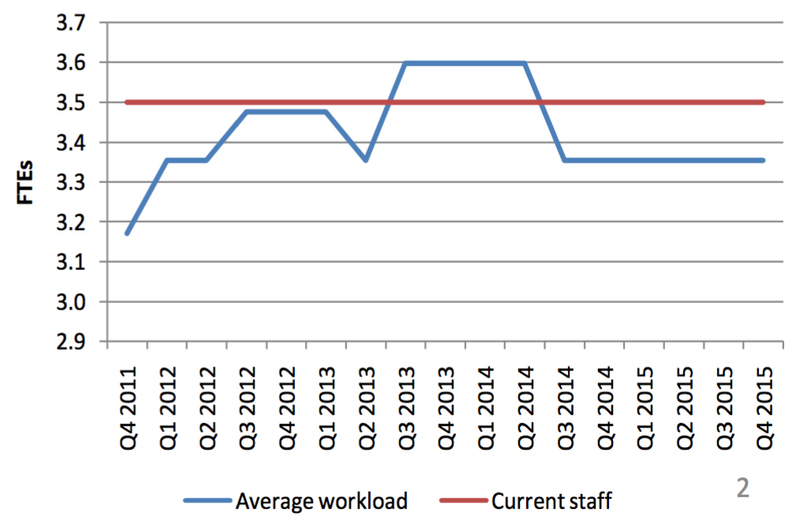 His evaluation reflects the following workload charts by department. Based on early estimates, the Planning Department would need an additional two to three full-time staff to complete the Strategic Plan. In review of the workload, one of the Planning Department employees was defined as focusing on Public Affairs. Later, Mr. Lopez conducted an additional analysis and charts showing the Planning Department workload redistributed throughout the Strategic Plan time horizon and separating the Public Affairs position out from the Planning Department and creating a separate Public Affairs Department. 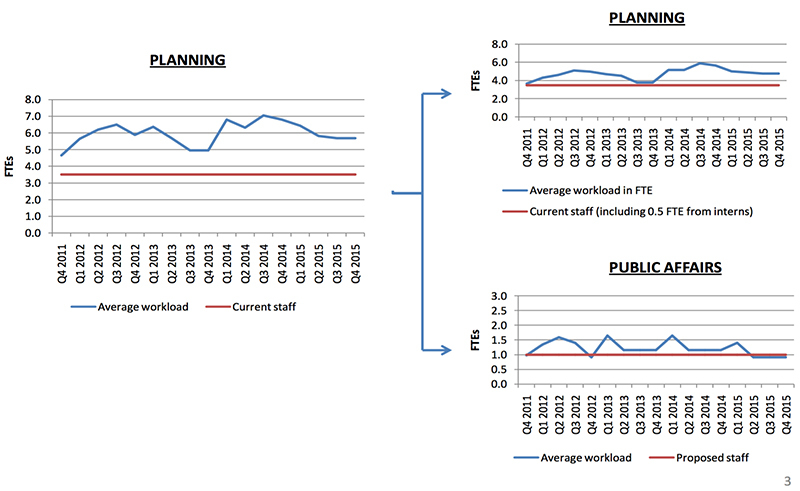 These charts reflect that even with the addition of a separate staff person dedicated to Public Affairs, the Planning Department would still need approximately one extra staff person to complete the Strategic Plan. The resources necessary to accomplish the work tasks by the deadlines defined will be dependent on a number of factors. Near-term tasks (through 2013) are generally defined and the level of effort estimated. Some longer-term activities running through 2015, such as project implementation tasks, are less defined since the project details are not known. Assumptions have been made about the scope of work/level of effort for these tasks. In evaluation of the work load to complete the SAWPA Strategic Plan, an independent evaluation of work load and staffing resources by SAWPA department was prepared by Salvador Lopez under contract with SAWPA. For the Engineering and Operations Department, the need for one additional FTE over the next two years to accomplish defined tasks was identified. Currently, the Engineering and Operations Department contains the following staff. The additional staff person would allow for the development of an Inland Empire Brine Line Business Plan including a capacity management plan, further work on alternate disposal alternatives such as the Salton Sea and management of the State Proposition 84 IRWM Implementation projects. The Proposition 84 management is funded through FY 2015. In October 2011, SAWPA department heads were asked to provide a list of work performance efficiencies that could be implemented to address additional tasks of the Strategic Plan without additional labor hours. The Engineering and Operations Department has already been implementing several initiatives (Brine Line permitting and capacity management “red teams”, marketing, multi-year contracting) and identified the top three new initiatives to further improve efficiency (contracting for two years with an optional third year, utilizing additional Administrative Services staff to manage activities, and expand the use of GIS-based tools to store facility data and track/perform system maintenance. These organizational efficiencies are expected to free up about 10-15% of the Department’s workload but still well short of the additional time needed to make-up for another full-time staff member. Currently, the IT Department consists of the following staff. Legal resources within SAWPA consist of one FTE, the Executive Counsel. Outside counsel are retained for litigation matters. The concept of bringing legal services in house in 2010 was intended, among other things, to be an efficiency measure, in that the Executive Counsel is expected to perform general counsel services in less time than one FTE, and add other services to the SAWPA team, as well. For example, the Executive Counsel is currently also serving as project manager for one planning project, the Stormwater Quality Standards Task Force, is assisting with certain tasks in the OWOW 2.0 Plan, and is assisting with legislative and policy advocacy and public information issues. Predicting legal staff is difficult, particularly because of uncertainty about the workload that will be associated with general counsel tasks, as discussed below. 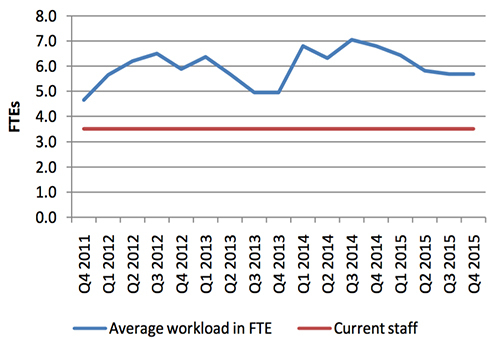 A projection of workloads done in conjunction with the Strategic Plan process showed a peak of nearly two FTEs in 2012, dropping to just below one FTE by 2014. This trend is associated mainly with the Strategic Plan tasks and the completion of the Stormwater Quality Standards Task Force. Implementation planning must identify the efficiencies and the flexibility that will allow this workload to be evened out over a period of four years while still meeting timelines that are externally driven. Currently, the Administrative Services Department consists of the following staff. In the event staffing is increased by two or more in any of the other departments, with the exception of the Finance Department, an additional Administrative Services support person may be needed. Currently, the Finance Department consists of the following staff. Given the requirements of the Strategic Plans projected work load, the Finance Department has sufficient resources for completion of the tasks by the estimated completion dates as defined in the plan. To address the completion of the new SAWPA Strategic Plan by FYE 2015, a goal was established to seek to complete the strategic plan as much as possible with the existing staff. The OWOW Plan is funded in a large part by outside grant funding to SAWPA from a California Department of Water Resources Proposition 84 Planning grant and to some degree by federal funding from the U. S. Bureau of Reclamation. The remaining 65% of the new SAWPA Strategic Plan will need to be accomplished using available resources and consulting services. Source of funding for the staff or consulting support is also a major concern. As indicated previously, even with the implementation of proposed work performance efficiencies, additional staff or consulting services are necessary to make up for the three additional staff recommended by the SAWPA consultant, Salvador Lopez, to complete the Strategic Plan. This is considered the primary constraint to effectively accomplishing the plan by FYE 2015. Defer other Inland Empire Brine Line activities that are of a lower priority (shift taskpriorities). To address the completion of the new SAWPA Strategic Plan by FYE 2015, a goal was established to seek to complete the strategic plan as much as possible with the existing staff. IT currently is staffed by three full-time positions and one intern, along with several IT consultants manage the technology infrastructure of SAWPA. Many of these technologies will provide support to the goals laid out in the Strategic Plan. Web presence technology including social media, Geographical Information Systems (GIS), and advanced communication capabilities will directly support the Plan. Several proposed solutions have a direct impact on the IT Department on whether we have the staff resources to help provide support for the plan. Solutions such as adding a project manager to the staff would free up our GIS Project Manager, who currently manages the Proposition 84 project, to focus on delivering GIS functionality to the Plan. Other Strategies such as streamlining efficiencies have a large impact on IT staff time since most of these efficiencies are based on technology that has yet to be implemented. This was not included in the Strategic Plan hours and has yet to be prioritized. The prioritization determines when the impact to IT staff occurs. In order to cover short-term resource deficiencies, the IT Department would either outsource the work to consultants or bring in project based interns. Either of these solutions does not completely eliminate the work load from the IT Department since both the consultant and the intern must be managed. To achieve SAWPA’s goal of achieving efficiency by bringing Legal Counsel in-house, it is essential that legal services and the other tasks with which counsel is involved be performed as efficiently as possible. One significant challenge is that the work associated with general counsel is often reactive to circumstances or to the actions of others and is difficult to manage. For example, the current pace of SAWPA’s activity in maintenance and repair of the Inland Empire Brine Line naturally creates numerous legal issues, but then other requirements are added by extreme weather, line breaks, spills, disputes with bidders or contractors, and litigation and potential litigation. When general counsel services are provided by a retained firm, the firm offers efficiencies (library costs spread over multiple clients; the ability to tap into the experiences of a number of attorneys) and flexibility (several attorneys can be active during a busy period, and then work for other clients at other times). SAWPA’s in-house counsel must identify other ways of achieving similar efficiencies in order to ensure that enough time is available to complete the tasks identified in the Strategic Plan. Funds have been budgeted for outside counsel for certain legal tasks, particularly litigation. However, it is not envisioned that significant additional funds will be used to achieve the Strategic Plan tasks for which legal staff is the lead. SAWPA does have relationships with consultants and partners that relate to the Strategic Plan tasks for which legal staff is the lead, and these relationships will need to be used effectively. The Administrative Services Department’s additional workload in support of the strategic plan initiatives/tasks will be highly prioritized and weaved into our ongoing daily activities. Working with the department heads and project managers, we will implement as many of the streamlining efficiencies as possible and appropriate. The Finance Department’s additional workload in support of the strategic plan initiatives/tasks will be highly prioritized and weaved into our ongoing daily activities. Working with the department heads and project managers, we will implement as many of the streamlining efficiencies as possible and appropriate. To deal with the previously defined constraints, a series of solutions are proposed that will allow the new SAWPA Strategic Plan to conceivably be accomplished within its defined time period. 1. Add new FTE employee as originally planned and budgeted. Under the existing FYE 2012 and 2013 SAWPA budgets, a new project manager position is defined to support the Proposition 84 IRWM Implementation grant administration. This position is essential to serve as the key staff contact at SAWPA to work with DWR staff in ensuring contract compliance and appropriate deliverables. Funding for this grant administration is available under the Round 1 Proposition 84 Implementation grant in the amount of $666,000. It was anticipated that the grant administration would be applied over the construction term of the 13 projects defined under Proposition 84, Round 1, approximately four to five years. It is anticipated that if the new job position was filled with a project manager/planner, perhaps this position could take on the dual role of both grant administration, as well as planning functions. It is recognized that grant administration for the Proposition 84 Implementation funding could not be legally applied to non-grant administration functions. However, there are some SAWPA Strategic Plan strategies that may be considered as important tools that could potentially enhance the efficiency and streamlining of the grant administrative functions of the overall Proposition 84 IRWM grant administration. Further, for tasks that are not related to Proposition 84 IRWM grant administration, sufficient funding under Proposition 84 Planning grant exists that could be applied to this new position that address OWOW Plan 2.0 tasks that are also covered in total or in part by the new SAWPA Strategic Plan. The only downside to this approach is that the Proposition 84 Planning grant funds to support the planning functions of the position would only be available for the first two years and not the four to five years of the implementation grant administration. This solution consequently may not be sustainable. If the constraint of insufficient funding for the new position beyond the next two years is a barrier to moving forward with the hiring of the new project manager/planner position, it is recommended that a part-time grant administrator be hired as soon as possible to serve as the main DWR contact for the Proposition 84 IRWM Implementation grant administration. This position would be somewhat similar to the previous Proposition 50 temporary grant administrator hire with the exception that some project site inspection and verification experience would be helpful based on our recent experience with administering Proposition 50. 2. Consulting Services. In addition to staff resources, outside consulting support should be considered as an important supplement to accomplish the new SAWPA Strategic Plan. The value of using consulting services is that there may be Strategic Plan work tasks that are more specialized in nature or may be beyond the skill set of the SAWPA staff which can be more efficiently and effectively accomplished by consultants. An example of this is in the development of Information Technology tools planned as part of the OWOW Plan 2.0 where an experienced Flex programming consultant could be brought in to support certain task functions. In this way, staff resources are better devoted to tasks that they can perform more efficiently without having to invest valuable labor time on a steep learning curve. This approach will be particularly valuable for specific OWOW planned tasks in developing water quality outreach tools, watershed assessment/report card, GIS performance tracking tool on IRWM implementation projects, and website design, many of which are related to goals defined in the Strategic Plan. Further, consulting support has been budgeted and is expected in FYE 2012 and 2013 for the detailed feasibility analysis expected for the 5-10 system-wide project/programs that arise from the Master Craftsmen concept paper. 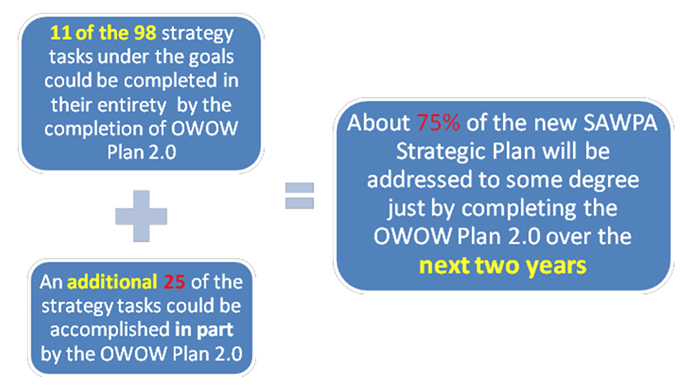 The use of consulting support to supplement staff for the remaining tasks of the Strategic Plan that are not covered by OWOW also can occur and is encouraged. The biggest challenge is managing, organizing, and taking advantage of synergies for FYE 2014 and 2015. Funding sources other than what is provided by the SAWPA member agencies has not been identified. Staff anticipates taking full advantage of every opportunity to pursue outside grant opportunities to help support staff and consulting needs. If successful, resources to complete Strategic Plan by FYE 2012 could occur. 3. Training for Efficiencies. Computer, facilitation skills, understanding member agencies’ planning functions/operations, work performance skills, and business process improvement. 4. Hiring Additional Student Interns, Unpaid or Paid w/o Benefits. The use of student interns could help support existing staff with the accomplishment of many of the SAWPA strategic plan goals and free up higher level planning staff from more routine and basic planning functions. SAWPA’s past history with student interns has generally been very positive with internships being extended to high performing students. Currently, SAWPA uses student interns in most departments under a paid, low wage, non-benefit status. Hiring unpaid students may produce positive results to extend available resources, however, legal restrictions apply to the use of unpaid student interns under the Fair Labor Standards Act. Due to the minimal funding impact, if additional student interns are hired, staff recommends that they be added under a paid status to avoid potential legal and auditing concerns. At the same time, SAWPA should be alert to opportunities to use unpaid student interns when a specific task of the agency aligns with a student’s significant academic project, such as a graduate thesis. The development of new analytical tools, new applications of emerging technology (e.g. social networking), or innovative scientific investigations could be primarily academic activities that might also benefit SAWPA, while SAWPA enhances the educational experience by serving as a laboratory for new ideas. Securing adequate work spaces for additional interns may be a concern but may possibly be addressed through “double bunking” of work stations. 5. Cross-training of Staff. 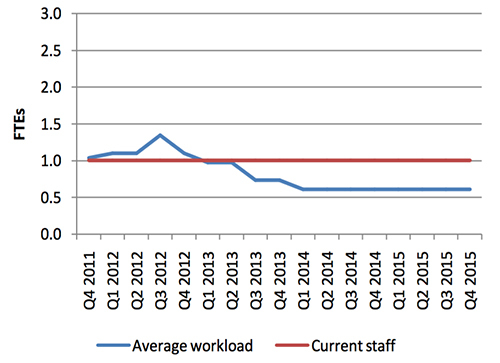 The training of staff among departments could enhance efficiency and fill in temporary gaps between non-regular workloads and available resources. For example, if labor shortfall arises in one department, the employee or intern from another department can be temporarily lent to the other department for use on a temporary basis. 6. Utilizing Member Agencies’ Staffs. Member agencies’ staffs might augment SAWPA resources by working on specific tasks in the Strategic Plan. This approach is only suitable if an employee could be temporarily assigned to SAWPA and actually works for SAWPA for a period of time necessary to achieve the indentified tasks. The concern is that a less structured approach would create management challenges that would erode the efficiency to be gained. 7. Streamlining Efficiencies. In October 2011, SAWPA department heads were asked to provide a list of work performance efficiencies that could be implemented to address additional tasks of the Strategic Plan without additional labor hours. The Planning Department prepared a list of 15 work performance efficiency measures. 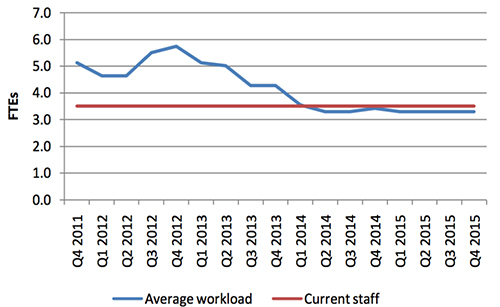 Other departments also submitted at least three work performance efficiency measures. This overall list was prioritized and evaluated by SAWPA department managers and the General Manager and is shown as Appendix B. These organizational efficiencies are expected to impact the IT Department and those hours are not reflected on the workload charts. These organizational efficiencies are expected to free up only about 10-15% of the Department’s workloads but still well short of the higher percentage needed to make-up for additional full-time staff as recommended by the Strategic Plan consultant. To fully address the implications of the workplan for the strategic plan to the organization, an additional study is recommended to evaluate the financial impact of the Strategic Plan workplan activities. Some of the strategic plan goals and work tasks associated with them have an outside source of funding while others do not. The overall impact on SAWPA for the next five years could be significant if some workplan tasks with no funding are prioritized over workplan tasks with outside funding. A separate study is recommended to evaluate this in the near future. In summary, every effort will be made to assure that the Strategic Plan priority goals are addressed with ongoing responsibilities. However, details of future staff resources for FYE 2014 and 2015 have not been defined and with the completion of the OWOW Plan 2.0 by 2013, existing staff resources will be more readily available to apply to the remaining Strategic Plan tasks. Again, one of the primary constraints to this approach is that source of funding to implement some of these additional tasks has not been clearly defined. Hire budgeted Proposition 84 IRWM administrator/planner position as soon as possible to improve work performance and efficiency for all. Develop in-house training and expertise for conflict management and resolution to decrease high- priced consultant use. Utilize available grant funding to support consultant contracts for necessary expertise that cannot be as efficiently done in-house e.g. flex design experts for IT needs, watershed assessment/report card, system-wide project/program feasibility studies for OWOW Plan 2.0 etc. Consultant contracts for necessary expertise that cannot be as efficiently done in-house e.g. flex design experts for IT needs, watershed assessment/report card, system-wide project/program feasibility studies for OWOW Plan 2.0 etc. For recurring work, extend duration of service contracts to at least 2 years with option for 3rd year. Reduces staff time to complete RFQ process. Current contracts are 1 to 2 years in duration. Use GIS tools to store Brine Line data, create work orders, schedule recurring work, and track problem areas. This effort is being coordinated with WMWD new CMMS system. Use one Admin staff as a part-time PM to administer RFQ process in spring 2012 and administer/manage simple projects for completion. Use “Touchdown” app on Droid phones to integrate tasks on Outlook and Droids. This app integrates the Droid and Outlook. Integrate GIS and OnBase documents. This will allow documents to be associated spatially. Be able to check out notebooks and projectors through Outlook. This will allow us to track who has what. Connect event calendar to meeting rooms. Currently, we have to make sure we make an appointment in two places so that the events calendar and the meeting room calendars sync. All outside legal tasks to have an associated budget agreed upon by outside counsel. Look for opportunities for lump sum task-based payment. One way to ensure efficiency is to control costs, relative to the ends to be achieved. For all matters for which outside counsel is required, Executive Counsel will ensure that legal service providers are working under a budget. Executive Counsel will explore opportunities for beneficial billing methods, such as lump sum task-based payments, that could save money. Executive Counsel will continuously monitor legal matters being handled by outside counsel to ensure that the costs SAWPA is incurring make sense considering dispute. These practices will ensure that sufficient funds are available to allow outside counsel to address all appropriate matters so that Executive Counsel has time available to address Strategic Plan tasks. Improve productivity (or reporting of productivity) of State lobbying contract. There are a number of Strategic Plan tasks that legal staff may be in able to assist with, even while not being the lead, such as the tasks under Goal 5. Keeping in mind that efficiency can be improved either by lowering costs or by increasing productivity, Executive Counsel will work with the General Manager and SAWPA’s legislative advocates to seek ways to improve the effectiveness of existing lobbying efforts to help achieve Strategic Plan goals. Establish supporting relationships with member agencies’ counsel to shorten research time on routine issues. In order to create efficiencies similar to a law firm, Executive Counsel will form strong collaborative relationships with the general counsels of SAWPA’s member agencies. 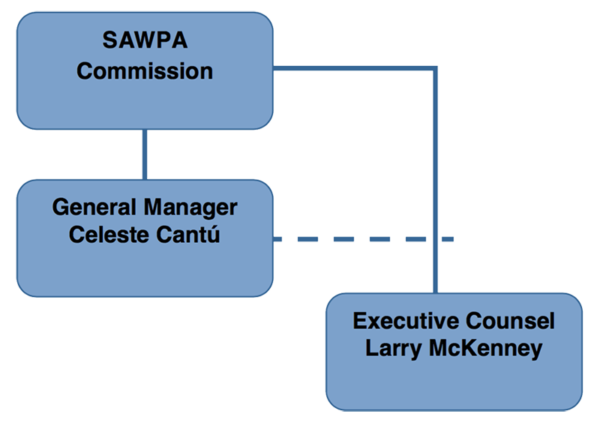 The member agencies share an interest in SAWPA being efficient, and for almost all general counsel matters there is no conflict of interest issue in conferring. Member agency counsel would not be asked to provide legal services, of course, but because of their diverse experience, and the library of reference materials and work product they possess, could significantly shorten SAWPA’s work time on normal general counsel activities. Look for opportunities to streamline business processes during review of all agency policies during the next year. A legal task planned for FY2012 is to conduct a systematic legal review of existing SAWPA policies. During this review, Executive Counsel will seek opportunities to streamline SAWPA’s business practices in order to facilitate accomplishment of Strategic Plan tasks. At the same time, however, the review of existing policies is also a task that could be reprioritized or spread out over a longer time to even out the legal workload during the next four years. Assess the need for admin support (i.e., recording/taking minutes). Prepare “action” notes (a one-page recap of decisions) vs. meeting notes and possibly saverecording to supplement the notes. Reduce hard copy paper reproduction at all meetings by loading documents into USB drive or laptop to be shown via projector at out-of-house meetings. Use projector to show agenda/meeting handouts etc. in-house as well. Utilize meeting table “signage” at meeting agenda table with just one copy and the signage, “Previously emailed copies”. Project Managers could require as part of work/scope that consultants to bring enough copies to meetings rather than last minute rush to copy for staff to make them. Consultants should give us 24 hours notice. Better yet, require that they be sent ahead of time electronically. 17. Assess utilizing e-sigs on various accounting processes (i.e., request for work orders, work orders, request for purchase orders, purchase orders, procurement forms etc.). 18. Electronic time sheets for a two-week period. 19. Do blanket purchase orders for Staples and others and eliminate a purchase order for each purchase. 20. Received electronic AP invoices and sent electronic AR invoices. Re-evaluate what is performed “in-house” versus by contract re brine line. Post documents for member agency use using On-Base re brine line. Red Team Initiative – hauled waste – streamline/coordinate activities of Collection Stations. LWH permits being issued by SAWPA. Standard permit application forms in use for LWH permits and Generator Permits. A single LWH permit can be used at any of 4 Collection Stations. Pending: use of alternate Collection Station during emergency or planned shutdown for M&R – requires Member Agency changes to Ordinances. Marketing – working to publicize Brine Line to bring new customers. Increased flows reduce cost per MG. Working to streamline new customer process – Corona Resource Recovery is test case. Video conferencing – technically feasible? Maximize use of planning interns and low-cost admin staff for more tasks particularly with OWOW Plan 2.0 task deliverables. Encourage task force agencies to print their own copies, if desired and bring to meetings. Encourage task force agencies to receive any task force deliverables in electronic format only to avoid hard copy processing. Streamline Commission packet agenda prep with an electronic only version. Print version of that can be given as a public copy. No agenda packets for senior staff and possibly Commission. Senior staff can print out relevant sections as appropriate and review electronic copies. When producing routine communication items such as agendas, announcements, etc., eliminate sending back reviews to original author and allow document to be modified as needed as it rises from project manager, to dept head, to admin reviewer, to general manager. This techniques to similar to news article review approaches used at newspapers and is described as an “up and out” approach. Regular SAWPA staff meetings – short and with an agenda- to make sure staff is up to date and not working cross purposes. And also it’s an opportunity to regularly reinforce the “consultant” mentality. Add roundtable report component to Dept. Manager’s Meeting that is strictly limited to a 10 min report per dept of primary interest to other depts. Centralize calendar and posting meeting information in ONE place using ONE format. Create an electronic bulletin board (as part of SAWPA web-page) as a complement to SAWPA calendar to announce/list each department’s current projects and on-going activities of significance… to enhance internal communication. Regular SAWPA staff meetings – short and with an agenda – to make sure staff is up-to- date and not working cross purposes. And, also it’s an opportunity to regularly reinforce the “consultant” mentality. Record all Xeroxing efforts that exceed 100 pages in one Xeroxing session and assign to specific SAWPA Acct Fund/Projects to assure proper accounting of hard copy costs to specific projects with the goal to reduce hard copy costs. Created web-based posting of customer information for the renewal of permits, costs including a “cost calculator” and copies of Ordinance No. 5 and all Resolutions. Created web-based “potential customer” page with often requested data.